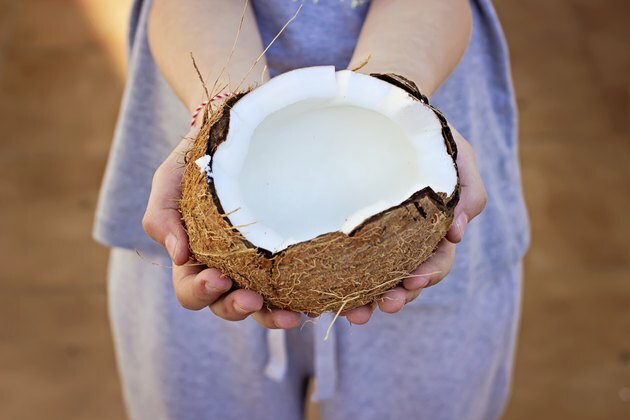 For thousands of years, coconut has been part of the daily diet of many Pacific islanders, and various coconut-based products are now available in the U.S. to provide your diet with a delicious exotic touch. If you have diabetes, carbohydrates are the most important nutritional factor to control it. Counting your carbs at each meal is the best way to keep your blood sugar levels in check. However, most diabetes exchange lists do not include coconut meat and other related products and it can be difficult to know how coconut can fit in your diabetes diet. A piece of fresh coconut meat of about 2 by 2 inches and about 1/2 inch thick contains 159 calories, 6.9 g of carbohydrates and 4 g of dietary fiber. When tracking your carb intake with diabetes, you can subtract the dietary fiber from the total carbohydrates to determine the available carb content, also called net carb, of a food. In this case, a small piece of fresh coconut meat would contain 2.9 g of available carbs. If you eat two to three pieces that size, double or triple the amount of carbs. Use available carbs when tracking your carb intake, as they give a more accurate picture of how your food choices will influence your blood sugar levels after your meal. Unsweetened dessicated coconut meat contains 187 calories, 6.7 g of carbohydrates and 4.6 g of fiber per ounce, which is the equivalent of 2.1 g of available carbohydrates. The same serving of sweetened dessicated coconut meat provides 129 calories, 14.7 g of carbohydrates and 2.8 g of fiber, or approximately 11.9 g of available carbohydrates. Stick with unsweetened coconut products to keep your carb intake within your recommended target and avoid making your blood sugar levels rise above the desirable range. Coconut water contains 46 calories, 8.9 g of carbohydrates and 2.6 g of fiber per cup, or 6.3 g of available carbs; unsweetened canned coconut milk contains 223 calories, 3.2 g of carbohydrates and no fiber per 1/2 cup; and canned, sweetened coconut cream has 264 calories, 39.4 g of carbohydrates and 0.1 g of fiber per 1/4 cup. Stick to unsweetened coconut products and watch the serving size to keep your carbs within target. Although coconut meat contains small amounts of carbohydrates, most diabetics are worried about its fat content. Coconut is rich in saturated fat, but the type of saturated fat it contains is very different from that found in animal products. Most of the saturated fat found in coconut oil is called lauric acid, which is not associated with any deleterious changes in your blood cholesterol levels, nor does it seem to be involved in the formation of fatty buildup in your arteries. Moreover, because most of its fatty acids are medium-chain triglycerides, they constitute an easy source of energy for diabetics. Because diabetics lack insulin or are resistant to its action, you may feel tired and lethargic because your cells are not able to get sufficient energy from sugar. By using coconut products, your cells have access to an easy-to-use and effective source of energy that doesn't require insulin, says Bruce Fife, coconut expert and author of "The Coconut Oil Miracle." How Much Avocado Can a Diabetic Eat? Can Diabetics Eat Too Many Cheerios? Can a Diabetic Eat Honey?